Dar Lighting Amalfi twin light wall fitting features a rectangular wall plate with a clear glass front supporting a stylish arm bracket, both in a sleek and contemporary polished chrome finish. A long, flexible LED light is attached to the bottom of the wall plate which provides focused illumination for reading and working. 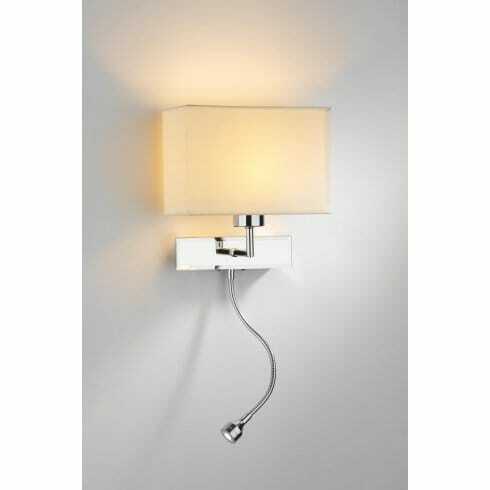 The product code for this Dar wall fitting is AMA0750. A simple contemporary design that boasts great style and practicality and is perfect for the modern home and family. Other shade options available are micropleat cream (S1075) or black (S1077) or taupe silk (ZOF0701. Both lights are individually operated with rocker switches situated at the base of the wall plate. This fitting is double insulated and is suitable for installation on flammable surfaces. The Amalfi range is also available as a twin light table lamp which also features an LED reading light, and a single light wall fitting that comes without the LED reading light. You can find the whole range on our website.